#WearStarWarsEveryDay kicked off a new challenge: the Star Wars podcast listener challenge for Force Friday (Sept. 30). Otherwise, just a regular week in wearing different Star Wars clothes every day – no new donations in Week 37, but we’ve already gotten some for Week 38. Thanks to everyone who has lent me a t-shirt that I’ve worn this week: Patricia, Bryan, Donna, James, and Lori! Remember, every day I wear a new and different Star Wars apparel item, my daily pledge makers will chip in $4.65 to Collateral Repair Project! This week, we’ve got a mashup of The Force Awakens and The Little Prince, Admiral Ackbar for Rebel Legion, and some throwbacks to the past: classic posters, SW:CCG cards, stuff from two Celebration Europes, and one that was worn to the first Star Wars Celebration. Plus I recently got to talk up the Wear Star Wars Every Day charity fundraising campaign to my friends, Sarah and Rich, on the Skywalking Through Neverland podcast. This review for Week 37 covers September 9 to September 16 of my wearathon, and an update on fundraising for Collateral Repair Project, a non-profit organization that provides emergency assistance, education, and community support to urban refugees. Only a few more days left in the month to be eligible to win cool prizes in our August giveaway for Wear Star Wars Every Day – there’s the uncorrected advance proof of Ahsoka by E. K. Johnston (book doesn’t come out until October), the just-released Aliens of the Galaxy by Jason Fry, a Celebration Europe crew t-shirt, and a SWCE Rusty Droid bottle opener. Plus here’s the recap video for Week 34 of #WearStarWarsEveryDay, full of news on donations, what I wore, and now the latest on what’s going on with Collateral Repair Project. Maxi big thanks to our anonymous GoFundMe donor this week, whoever you are! Also, thanks to everyone who has lent me apparel seen this week: Donna, Tony, Chris, and James! Remember, every day I wear a new and different Star Wars apparel item, my daily pledgemakers will chip in $4.65! This week, we’ve got some Rebel Legion wear, a pair of Boba Fett socks, a rarity from the 2006 US tour to promote the DVD release, and a really cool shirt from the #Cantina party at Celebration Europe. This review for Week 34 covers August 19 to August 25 of my wearathon, and an update on fundraising for Collateral Repair Project, a non-profit organization that provides emergency assistance, education, and community support to urban refugees. Thanks to everyone who has supported Wear Star Wars Every Day so far, both our one-time donors and our per-day pledge makers. While each day I continue my project, another $4.65 is donated by our pledge makers, but I’d love to get that total up to $5.00 even (or higher!) for the second half of 2016. If you’d like to chip in at a dime a day or a quarter per day (or more), make your pledge at the per-day pledge form and you can choose whether to support the project for the entire year, or just start at the beginning of September. Or you can just make a one-time or a recurring monthly donation at GoFundMe.com/WearStarWars2016. 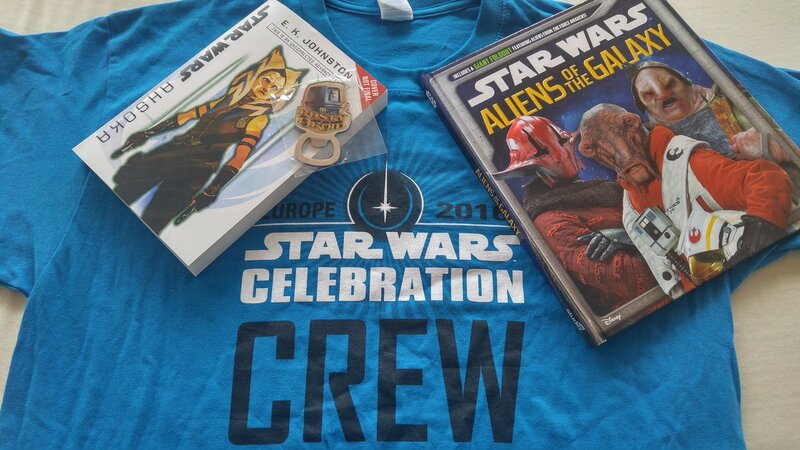 Remember, if you donate in August, you might be eligible to win the prize drawings for an ARC of the upcoming Ahsoka novel, a Celebration Europe Crew shirt, and more! #WearStarWarsEveryDay heads out of April and into its fifth month, May! No donations to Collateral Repair Project in this week, but we did have a whole bunch of folks who lent or donated clothing for the last two days of my Celebration streak and the beginning of my monthly focus on fandom! Thanks to Paula for the donated shirt, and Todd, Debby, Jennifer, and Caitlin for letting me borrow items of clothing — this time going on the small side with a bib and a ladies small t-shirt. This review for Week 18 covers April 29 to May 5 of my wearathon, and an update on fundraising for Collateral Repair Project, a non-profit organization that provides emergency assistance, education, and community support to urban refugees. Also, I was on the Galactic Fashion podcast recently talking about the project and about geek fashion for guys! Just a reminder, I want May to be a showcase of Star Wars fandom, highlighting different fan efforts such as websites, podcasts, costume clubs, collecting clubs, artwork, etc. So if you’ve got something cool to donate or lend, like a club shirt, hat or costume item, send it on over, and I’ll promote your group or solo effort. I’ve got plenty of 501st Legion wear lent to me, but stuff from other clubs would be awesome! Get the shipping info here. Report: Disney keeping Expanded Universe characters out of Star Wars Weekends parade? Word on the streets (well, the message boards) is that Disney has told the 501st and Rebel Legions that certain Expanded Universe characters are “not being allowed to march” in the Star Wars Weekend Motorcade. The only character we know for sure at this time is Mara Jade, but it’s easy to guess at several others from there. Nanci Tosche Station has thoughts. One big question: Would this apply to characters from other eras who haven’t crossed over into tv or movies, like the Old Republic, or does it only affect post-Return of the Jedi characters who may in the path of the sequels? Although this means certain costumers (including quite a few women) will no longer be able to march in the official parade, certain means of quiet protest have been suggested: Attendees can still dress in costumes or don EU character shirts. UPDATE: TFN’s Eric Geller reached out the Lucasfilm on this, and they told him “that neither Disney nor LFL ordered a prohibition on EU characters in the SW Weekends parade.” Tosche Station maintains they’ve heard otherwise from 501st members, although no one is yet sure how high at Disney the orders may come from. While at Comic-Con in San Diego, I got the chance to sit down with Star Wars author John Jackson Miller to discuss his upcoming novel Kenobi, his recently published sci-fi work Overdraft: The Orion Offensive, and his other upcoming projects, and a Kenobi giveaway from Del Rey at Comic-Con.